Are you good at accents? Are you bad at doing accents? Either way, this game is an absolute hoot and perfect after a few Sherries this Christmas. It’s an easy game, all you have to do is repeat a given quotation aloud in a randomly selected accent and see if teammates can guess what it is! You have just thirty seconds to utter one of the 90 quotations in the allotted accent and users must guess what it is you’re trying to do! This one is a bit more for the grown up crowd and is aimed at aged 16+. So do you think you can do the perfect Scouse or pass for an Australian? Put it to the test with Accentuate. 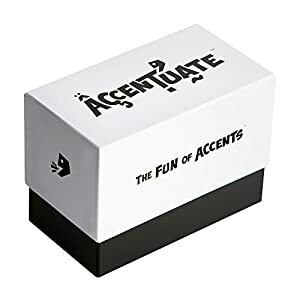 The distinctive black and white Accentuate box comes complete with 90 Accent Cards featuring 30 different accents from around the globe (each repeated three times), 90 different Quotation Cards, a timer and a dice to select game-play options. Its compact size makes it ideal for livening up festive visits to family and friends this Christmas. This fantastic quiz based game is a great way to test the grey matter (although not too much) this Christmas with all the family. Simply answer questions to earn letters and then all you need to do is form the word Linkee. The game has been updated for Christmas with new questions, celebrity surprises, new design and fancy pads and coloured pencils. It’s perfect for families! (19.99) We loved it and thought it was a great take on the quiz format! Thoroughly recommended! Linkee that is stocked in John Lewis, Argos, Toys R Us, Amazon and a number of independent High Street retailers. It is also the inspiration for the new BBC Quiz show, The Link, hosted by Fast Show funnyman Mark Williams. This game is a bundle of laughs and will have you laughing, bickering and entertained around the tree! How does it work? Well, the aim is simple; the aim is to lie without being caught out, and at the same time challenge other players’ lies. You can make up answers, lie about the correct answer, feed your opponents false facts and lie about the roll of the dice, just don’t get caught or it’s back to the start. There are three types of question: Multiple choice – read the questions and the two answers on the card (one true, one false) and a lie you’ve made up, you want your opponent to choose the lie. A normal question is as you would expect but you give the answer as well – if you give the correct answer or make one up is up to you. Truth or lie, you are given a true statement and a false one. You choose which to read and your opponent chooses whether to challenge. Finally there is the Risk It square – which says it all. A tension filled, highly competitive family game – prepare for family uproar. If you are a not up for a board game but want to keep yourself thinking this Christmas then why not try this Limited Edition puzzle from Gibson Games. 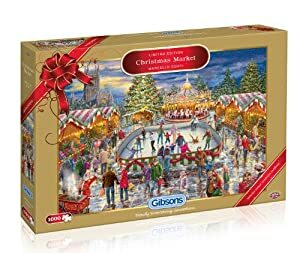 This 1,000 piece Christmas Market scene is rather sort after and not going to be available for too long, so make sure you get your hands on it as soon as possible. Find out more here: www.gibsonsgames.co.uk.